I often get a lot of questions about what people should eat before they workout. There’s a lot to say on this, and I can explain it all by breaking down one of my most delicious concoctions: my ultimate pre-workout shake. First, a little disclaimer: This shake is not intended for those who want to pack on muscle. Check out this article instead. I’m not interested in building bulky muscle, and in my experience, most people aren’t either. They just want to be lean, fit, and strong. If you want to get ripped, there are plenty of other fitness coaches who can show you how to do just that. I’m here to show you a smarter approach to your workouts and your nutrition so you’re constantly burning fat. With that in mind, this pre-workout drink fits splendidly into a fat burning diet and is a perfect way to kick off any workout. First of all, if you’re looking to shed a few pounds, this is the best pre-workout smoothie for weight loss. It’s because it’s packed full of protein, and if you want to burn fat, you should to be consuming something that’s full of protein and ideally high in branch-chain amino acids. That, or you want to be in a fasted state. Basically, if you’re looking for the extra little edge to improve protein synthesis for muscle building during your workout and help your recovery afterward, a good protein powder will do you good, especially if it’s mixed up in a tasty pre-workout drink. I’d like to suggest you give my own protein powder a shot. It’s called Pure Plant Protein and you can find it in my web store. Whichever protein powder you choose for your pre-workout shake, you want one that’s very low in carbs or contains none at all. Carbs will spike your blood sugar and insulin before your workout; that’s a problem because you don’t want to be relying on your glycogen and blood sugar during your workouts. Fat should be your primary source of fuel in your workouts. If you’re having bananas and heavy fruit-based shakes before you work out, then you’re not really allowing your body to tap into its fat reserves as a fuel source. What I’ll normally do is make a pre-workout shake with my Smooth Chocolate protein powdered water—that’s it. The protein powder is so smooth and tasty that you don’t have to worry about adding fruit for flavor. When I do this, I get a straight shot of 20 grams of protein that’s very high in branch-chain amino acids. This is specially formulated for muscle growth and muscle repair. Not all protein powders are created equal when it comes to branch-chain amino acids. If you’re using a protein that has a good amount of protein but is not very high in branch-chain amino acids, you’re not going to be getting the protein’s full benefit. Studies have shown it’s not even the protein before the workout that helps you; it’s actually those three branch-chain amino acids that really power your muscle repair. The only instance in which you want some carbs and sugars in your pre-workout smoothie is before a long-distance run or an ultramarathon type of event, as they’ll help you stay the course. I hope this has helped you figure out exactly how to blend up a pre-workout shake for weight loss. It’s remarkably easy to mix and it will make a tremendous difference in your workouts! When should i drink a pre-workout shake? 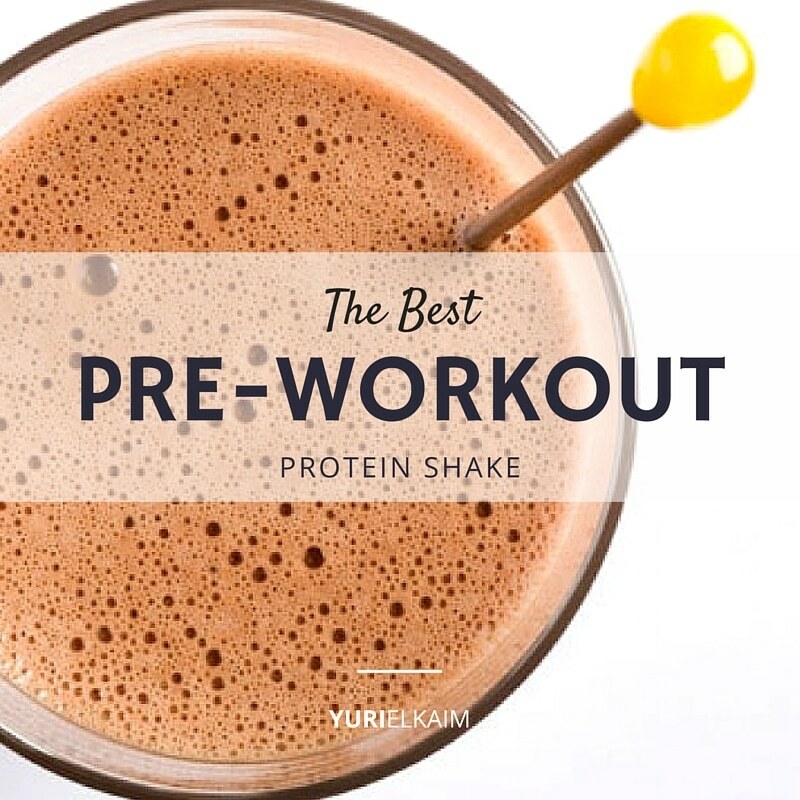 The ideal to time to have a pre-workout shake is about 30-60 minutes beforehand. Ideally, it should be very low in sugar/carbs to avoid spiking insulin which would result in your body relying on sugar as a fuel source during your workout instead of fat. Why have a pre-workout shake? You don’t have to and to be honest you’ll have an easier time burning fat and preserving muscle without one. At most, have brain chain amino acids (as mentioned above) in water. Alternatively, you can use my Pure Plant Protein which provides all your branched chain amino acids with little to no carbs. What are Branched Chain Amino Acids (BCAAs) and what are the benefits of using them? There are three BCAAs: leucine, isoleucine and valine. And although NOT necessary to consume before your workouts, there are a lot of studies that do show promising reasons for supplementing with BCAAs before a workout. Despite the fact that there’s boatloads of research showing BCAAs improve protein synthesis both after resistance training and in the absence of exercise, there’s not much evidence that this actually leads to greater muscle mass gains in the long term. It appears that total protein intake above a threshold roughly defined as 1.5 g/kg is most important for gaining muscle from resistance exercise.